In practical signal processing, it is common to choose the maximum signal magnitude as the reference amplitude. That is, we normalize the signal so that the maximum amplitude is defined as 1, or 0 dB. This convention is also used by “sound level meters” in audio recording. When displaying magnitude spectra, the highest spectral peak is often normalized to 0 dB. We can then easily read off lower peaks as so many dB below the highest peak. 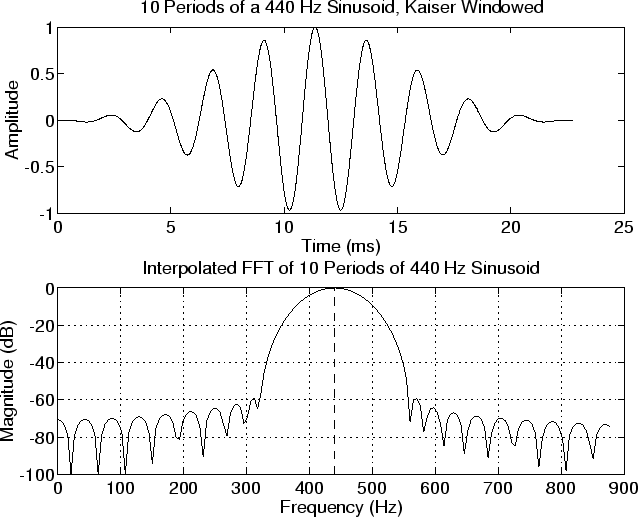 Figure 4.1b shows a plot of the Fast Fourier Transform (FFT) of ten periods of a “Kaiser-windowed” sinusoid at Hz. (FFT windowswill be discussed later in this course. For now, just think of the window as selecting and tapering a finite-duration section of the signal.) Note that the peak dB magnitude has been normalized to zero, and that the plot has been clipped at -100 dB. Figure 4.1:a) Ten Periods of a Sinusoid and b) its FFT magnitude. Below is the Matlab code for producing Fig. 4.1. Note that it contains several elements (windows, zero padding, spectral interpolation) that we will not cover until later. They are included here as “forward references” in order to keep the example realistic and practical, and to give you an idea of “how far we have to go” before we know how to do practical spectrum analysis. Otherwise, the example just illustrates plotting spectra on an arbitrary dB scale between convenient limits. % Ok, plot it already!